Microsoft has already told you who will win the men's NCAA basketball tournament. Now, the question is: why? The Microsoft Bing executives riding herd on Microsoft’s mathematical model of March Madness, Bracket Builder, crunched several quintillion combinations Sunday night, tracking the 68 teams and the various scenarios as they progressed through the tournament. It’s a new level of complexity for Microsoft, and good training for one of its next projects—predicting the outcome of the 2016 presidential election. Microsoft’s bracket predictions aren’t over, either. Microsoft executives said they plan to expose what might be called the “keys to the game:” what a team must do to win, based on Microsoft’s mathematical model, so you may talk knowledgeably about which teams will win, and how they will do so. What’s interesting, however, is Microsoft’s awareness of what March Madness represents: an emotional run for fans of the teams, complete with upsets, buzzer-beating shots, controversial calls, and gut feelings of which team will win, contrasted with the sheer mathematical logic of it all. 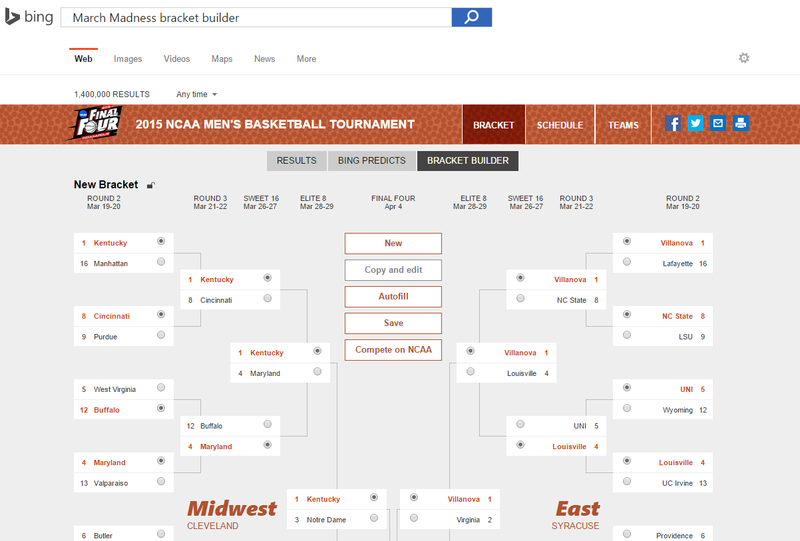 Microsoft's Bing Bracket Builder tool. Bryan Saftler, the senior marketing manager in charge of the Bing Bracket Builder, says that Microsoft’s goal “is not to replace your answer” on which team will win. “At the end of the day, our job is to remove a little bit of the emotion from the bracket-building experience, and operate more from a place of logic, so you’re going to end up with a smarter, winning bracket,” Saftler said. Bracket Builder operates like a normal NCAA bracket: It shows which teams are scheduled to play and allows you to pick a winner. You can hover your mouse over a particular team and see some key stats that Microsoft thinks are relevant. Click “autofill,” though, and the magic happens: Microsoft picks the remaining games, using your picks as absolutes. Are you utterly convinced that Duke and Kentucky will be upset early? Then Arizona wins, according to Microsoft. Microsoft plans to expose that reasoning via social media posts prior to every game, Saftler said. Originally, those justifications were designed to be part of the Bracket Builder UI. It’s probable that as the tournament progresses—and as games wind down into the Sweet Sixteen or Elite Eight, where there's more time between games—Microsoft will release a new version of the Bracket Builder user interface, where bracket players will be able to dig down through some of these keys to the game, Saftler said. “The moment that we start exposing those statistics, and show how we got there, you’re going to trust [Bing] more and find more value more understanding... We’re helping you make smarter decisions,” Saftler said. According to Walter Sun, the principal applied science manager overseeing the project, Microsoft also has the capability to adjust the predictions for a game as it progresses. If Kentucky opens its first game by scoring 25 unanswered points, for example, its win probability would climb to almost 100 percent, Sun said. Microsoft tried real-time predictions for the World Cup, however, and users became confused, Sun noted. So that feature may be left out for now, he said. Now that Bing's addressed the NCAA men's tournament, plus World Cup and NFL football predictions, you probably don't need the browser's powerful algorithms to guess what's next. When asked whether Microsoft plans to call the 2016 presidential elections, both Sun and Saftler responded with a chorus of yeses. Microsoft already tracks elections and other social and political questions as a matter of course. Microsoft also says it'll add the most popular vacation destinations, whether concert ticket prices are going to go up, and more to the list. Elections, though, could allow Bing to make predictions on a level of granularity that no analyst firm has before. Microsoft already has access to a wealth of social data, from partnerships with Twitter, Facebook, and more. Typically, analysts like FiveThirtyEight analyze polls—essentially all of that social data, but abstracted. That means Gallup can poll a cross-section of Massachusetts voters, for example, and determine what it thinks might be the most likely candidate. Why this matters: If Microsoft can obtain all of that social information itself—and remember, all of that aggregated polling information correctly called the 2012 elections—Microsoft might be able to make even more detailed predictions. That’s extremely valuable information to any number of people —especially if Microsoft can track results on the fly. March Madness is one thing, but it pales in comparison to what will take place in November of 2016.